NEW YORK - It's toy time! The annual New York Toy Fair is a massive opportunity for toy manufacturers to show off their newest and coolest items to retailers and the press. Here at Space.com, Toy Fair is one of our favorite yearly events, because we're suckers for space- and science-fiction-themed toys, and because we love to see the increasing number of science kits and cool tech toys that are appearing every year. This year, we saw tons of toys from the "Star Wars" universe (including a zoo of BB-8s), toys and games celebrating the 50th anniversary of "Star Trek," awesome drones, adorable plush planets and so much more (stay tuned for more coverage from Toy Fair). Here is a list of some of the Toy Fair items that we'd like to bring home, and that didn't fall into any particular category. Aeromax makes astronaut dress-up clothes for kids and adults. Visitors to science museums and space centers are probably already familiar with astronaut dress-up clothes for kids from the company Aeromax. They sell full-body astronaut suits (in white and orange), as well as helmets, gloves and boots; flight suits (blue); and astronaut jackets. They also sell an astronaut "space pack," which is actually a water gun with two auxiliary tanks. Later this year, the company will introduce a rocket scientist lab coat, and new sizes for some of their astronaut gear. They come in adult sizes, too. You can browse most of their offerings on Amazon. The Coji bot combines coding and emojis, to teach young kids the basics of computer coding. Multiple companies are making toys that introduce kids to the basics of computer coding, in some cases even before the kids are old enough to read. One example of this is the WowWee Coji robot. The name is a mashup of "code" and "emoji," because kids can give the robot commands using emojis, ranging from facial expressions to the wider range of illustrated icons found on most smartphones. The bot responds based on the unique emojis the child chooses. It is primarily operated using a tablet, which comes with games and activities that range from being just for fun, to teaching kids how to write a simple command code, to slightly more advanced "if-then" procedures. WowWee has been producing creative and thoughtful robot toys year after year, so we're not surprised they're part of this trend. Targeting even younger kids is Code-A-Pillar by Fisher-Price (owned by Mattel). The robotic bug consists of a head and detachable body segments that all give the insect a different command. Once the kids line up the pieces and attach them (they join via USB ports), hitting the start button causes the bug to carry out each command segment one at a time. So, it might do two right turns, two left turns, and play some music. It's an incredibly simple way to teach kids about lining up a series of commands and then telling the computer to execute the code. We love science toys, in general, and of course computer coding is an extremely necessary part of launching rockets into space, so we hope these toys inspire some future NASA programmers. Do-it-yourself science kits teach kids about everything from electric circuits to video game coding. There are a lot of do-it-yourself science kits out there, and here's another awesome entry. The small company Technology Will Save Us currently has a handful of science kits for sale, and they vary in difficulty and capability. The simplest one is the "Electro Dough" kit that lets kids add lights, buzzers and switches to their playdough creations, while learning a bit about electricity. The more advanced kits get into sophisticated electronics, such as building a speaker and then being able to use literally any object as a speaker housing — kids who tested the kits have used balloons, boxes, bicycles, bananas and more. There's also a kit to make a solar-powered sensor that lets you know when a plant needs water, and a DIY synthesizer kit. Finally, the most advanced kit available lets kids build a simple video game console (about the size and capability of an early-generation Nintendo Game Boy; some soldering required), which the kids can then program and make their own games. Representatives of the company said it was founded by a "mom who worried that her kids were born with an iPad" in their hands, but didn't have any understanding of the technology that made their favorite gadgets go. Electrical engineering is an essential, though perhaps underappreciated, aspect of building everything from rockets to space telescopes, so we love that these toys get kids interested in (and appreciative of) the work that goes into creating all kinds of electronics. You can find even more science kits in the Space.com store. There are a lot of quadcopters on the market these days, but only one with a Barbie doll riding it like a hoverboard. Mattel has been making some changes in its line of Barbie dolls, and here comes another one: Barbie as space explorer. A new series of Barbie dolls, inspired by characters from an upcoming Blu-ray movie, will include a Barbie mounted on a remote-controlled quadcopter. Barbie rides the drone like a hoverboard, and the vehicle is easy to maneuver and keep stable. There's more flying power in the new line: One of the Barbie dolls has a pet cat with its own working helicopter suit. The flying cat isn't remotely maneuverable — it is operated with just an on-off switch — but it is attached to the doll with a leash, so kids can drag it around as it hovers above the ground. Another of the dolls rides a hoverboard that has motion-controlled lights, and a pivot bar so she can do flips and other tricks. We think the new line is a step up from the astronaut Barbie released in 2013. Plush dolls from the out-of-control science fiction cartoon show "Rick and Morty" are available from Jinx, with more characters being released this year. One of the greatest science fiction shows currently on TV is a cartoon on the Adult Swim network called "Rick and Morty." At first glance, the show is an irreverent comedy about Rick, a scientific genius who regularly travels to other planets, through time, and into other dimensions with his grandson, Morty. He's also a massive jerk, and probably an alcoholic. But the show, created by Justin Roiland ("Adventure Time") and Dan Harmon ("Community"), also contains incredibly creative and expansive science fiction plotlines. Fans of the show may know that there aren't really any "Rick and Morty" toys on the market (other than the surprising number of fan-made toys that are occasionally sold on websites like Etsy), but that's changing. Plush "Rick and Morty" dolls are now available from Jinx. Also available from "Rick and Morty" are Meep dolls, and more character dolls are coming later this year, including Beth, Jerry, Summer, Snuffles, Talking Cromulon and Mr. Poopybutthole (yep, that's a real character from the show). Jinx also has merchandise from "Minecraft," "World of Warcraft" and many more. Bloxels let users build their own video games, using colored blocks and a tablet app. This toy is awesome for anyone who ever wanted to build their own video game. Bloxels lets you design a Mario-like game with a board, differently colored blocks and a tablet. You can create levels, characters, animations and power-ups by placing blocks on the board to make a picture. When you take a photo of the board with your tablet, the level, character or whatever else you created is uploaded into an app that creates a game. From there you can choose your characters and run through the game. There are even white blocks that let you add text on the app so you can insert instructions. The basic Bloxels box set (including one board, the blocks and the app) costs $49.99. They launched three weeks ago, so the app is already available on IOS and Android. They'll eventually make it available on PC and Mac. ThinkFun presents the first at-home boardgame version of "Escape the Room." ThinkFun is releasing the first ever "Escape the Room" at-home board game on March 1. Players get stuck in a room at an astronomer's mansion and have to find clues to figure their way out. The backstory is that the astronomer's wife died and he went kind of mad and boarded up the house. Sometimes weird things happen there — like when the house begins to glow. The board game is inspired by the classic "Escape the Room" games that were initially digital, and later become live-action activities in which people get physically locked in a room together, and have to solve a puzzle to escape. This new T-Rex robot is about 3 feet long from head to tail. It has a silly personality and "finds himself very funny," according to the Spin Master employee who showed the toy to us. The bot does things like burp and fart, and then laughs hysterically at itself. Its mood also changes, which you can tell by the color of its eyes: Red means the T-Rex is in a bad mood and you need to pet it to make it happy again. The toy comes in pieces, so kids also get to build it — build time is about 4 hours. The Megasaur retails for $99.99. 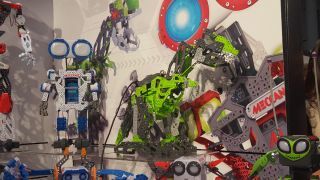 Spin Master has made our list of Toy Fair bests in the past, and makes particularly awesome build-it-yourself robots. MakerBloks teach kids about circuitry and electricity. An app-based game delivers challenges and puzzles that players must solve using the blocks. We wish MakerBloks were available when we were taking Electricity and Magnetism in college. These breakproof blocks (you can stand on one and not even dent it) make learning about circuits so easy even kids under 6 can do it. The box comes with a set of resistors, switches, buzzers, batteries, splitters, processors and LED lights. You can play with them on their own to create circuits that light up or buzz, but the toy also comes with a tablet app and a game to help kids stay interested in building new circuits. In the app, a girl named Gabi walks around her neighborhood and comes across neighbors who need her help. At one point she finds a police officer who can't get the light on his car to work, so the kids have to build a circuit that fixes the problem. MakerBloks plans to have Gabi travel through space in the next version of the app. The set is available for pre-order now, and should come out in a few months.